Free training in retail, wholesale, online “Business Opportunity of A Lifetime”. KAYSER Underwear / Intimates / Sleepwear / Hosiery's new retail, wholesale, online famous branded intimate, underwear, sleepwear, sock, hosiery business training provides free information for Established Agents and Distributors, CEO's, Managing Directors, Brand Builders and Influencers looking to improve their skills. For Established Agents and Distributors, CEO’s, Managing Directors, Brand Builders and Influencers wishing to create multiple revenue streams to add to your existing business in retail, wholesale, online famous branded intimate, underwear, sleepwear, sock, hosiery business expertise, KAYSER Underwear / Intimates / Sleepwear / Hosiery is offering free training sessions ongoing once a business relationship is established. The training will be held via training videos, video conferencing, and the day to day inner workings via text and emails, with onsite meetings in Santiago, Chile where you will be invited to meet and work with the designers, marketing teams, and company leadership. KAYSER will invite you and your team to visit headquarters once the requirements are reviewed and agreed on. This visit will take 4 full days at KAYSER Headquarters. For full details, interested parties are encouraged to view the website at https://kayserglobal.com. *How to become an exclusive KAYSER Distribution Partner in your country. *How to open a retail store, online business, wholesale business. *How to merchandise the products. *How to develop a logistics center. *How KAYSER provides all the marketing tools, photos, materials needed for successful social media campaigns. *How to set up and run a lingerie, underwear, sleepwear, socks, boutique, – we will teach you everything there is to know about the design process, different fabrics, different types and styles and sizes of bras, underwear, sleepwear, socks for men, women, and children of all age groups. “This is the business opportunity of a lifetime. 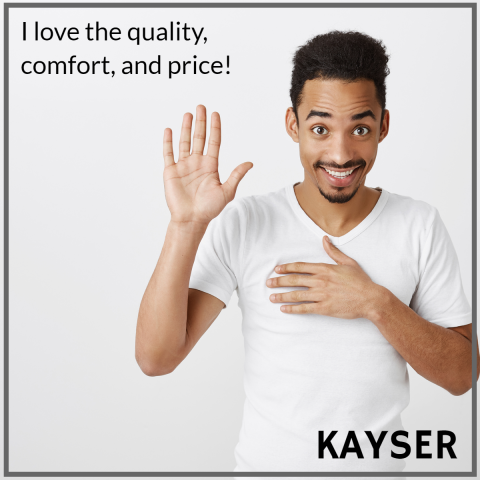 KAYSER truly cares more about their business partners than anyone can. This is a long-term relationship where you can fully trust that business is done in the right way. When KAYSER engages in business, they find a way to do more for others than anyone else. They find a way to truly serve. To care for people in a way that no one else can. KAYSER is given the gift of trust and influence. Business allows the company to make the invisible visible. Business allows you to be the creator. The focus is to do more for others than anyone else. To add massive value to the world. Business allows you to gain resources, connections and influence. And, with that, KAYSER can impact the entire planet for good. Established Agents and Distributors, CEO’s, Managing Directors, Brand Builders and Influencers can find the most up-to-date information about the free training at https://kayserglobal.com. Customers who have specific questions about the training itself may contact KAYSER Underwear / Intimates / Sleepwear / Hosiery via their website. Please visit The KAYSER Shop home of your future online, retail, wholesale business. KAYSER is a registered TradeMark.